“Ten Storms Revenge;” is a collection of separate unconnected stories with a diverse group of victims seriously derailed by the financial meltdown. Meet them all. As different as, well, all of us can be. As the chapters move forward their stories interconnect. I don’t think you’ll be disappointed. Ah, Revenge. Such a sweet tasty thing, isn’t it? 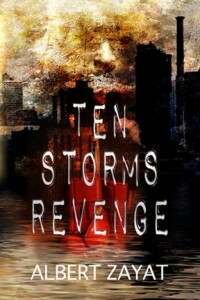 Get your print version of Ten Storms Revenge In now!